Wayne Franzen was often refered to as "a poor man's Gunther". Everything that Wayne did in the circus, he did well. Another of the great Wisconsin showmen! He is sadley missed by all. From the age of 9 to 17 I worked for MR. Franzen. They were some of the greatest and hardest years of my life. 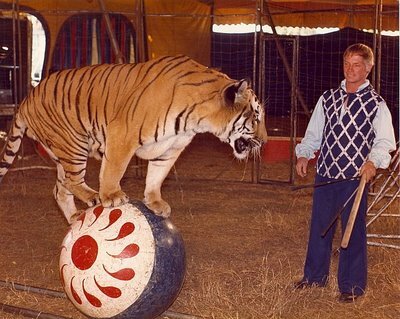 He was a great animal trainer and a terrific role model to a young punk around a show lot. A hardworking showman who met a tragic end. I always enjoyed Wayne's show. During setup he was all over the lot. Never seemed to rest. Wayne was such a talented trainer. And also one heck of a nice guy. The end was a great loss not only to his family, but to our business. He deserves to be remembered with the greatest respect. Does anyone remember the touching tribute to him on one of the networks or CNN by a newscaster who had met him and done a story? Wayne was always great to visitors. Spent sometime visiting and Wayne would make breakfast for everyone before the morning jump. Fun show to hang around. I had the pleasure to work for Wayne for 6 years. His was the first circus I worked for and I joined in his first year, 1974. By the time I left the show (end of 1984) we all knew that the performance was rather amazing for the relatively small show it was. 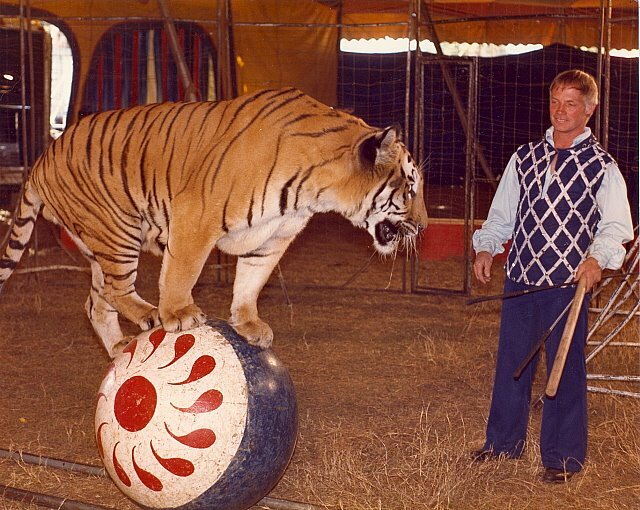 (The big top was an 80' with one 40') Wayne opened with 10 lions and tigers featuring Tony rolling the globe, doing a hind leg walk and Wayne riding him out of the arena. Okha, (Kosti and Megu, two baby Africans which we had just purchased were not in the act as yet), did a splendid single elephant act, hopping on the rolling globe as a finish. Wayne presented his 12 Pony of the America's liberty act as a finale. That same year we also had three men on the high wire, a nice three lady aerial ballet, cradle act, roman ring and single trap acts as well as a dog and mixed animal display and rolla bolla number all accompanited by a three piece band. Yes, we all worked very hard but no one worked harder than Wayne. Buckels, he had great respect for you. Though he never apprenticed under another trainer he deeply appreciated any conversation with an experienced trainer which might enhance his own training ability. He also appreciated as much as any trainer, meeting others who shared his passion for animals and animal training. Buckles, thank you for running this blog...it is good to talk circus again! I remember the year that we got the new Elephants. Steamer wanted to name them Talina and Raul.Lol. That was the same year that we got Rusty the tiger from Michigan City. I did an article on Franzen Bros Circus for the White Tops magazine in Aug of 1974 and took lots of photos. I just found some in an old box and would like to send them to Wayne's family. They are from the first season I believe, and inc shots of Wayne and Kathy and the show and ring. If anyone can help please call or email.